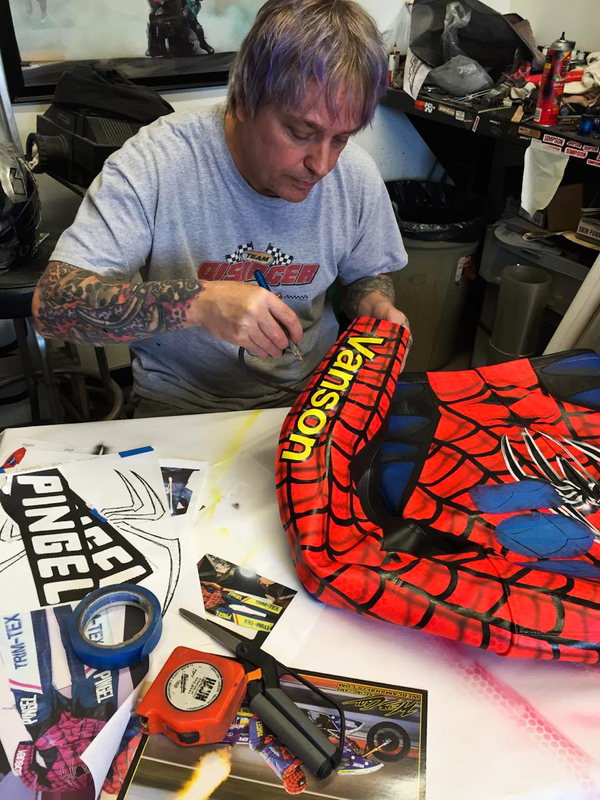 With the season opening Exoticycle, Roaring Toyz, 2016, MANCUP, event presented by Vance & Hines Racing, less than a week away; Larry McBride will be relieved to know his latest leathers are race ready. 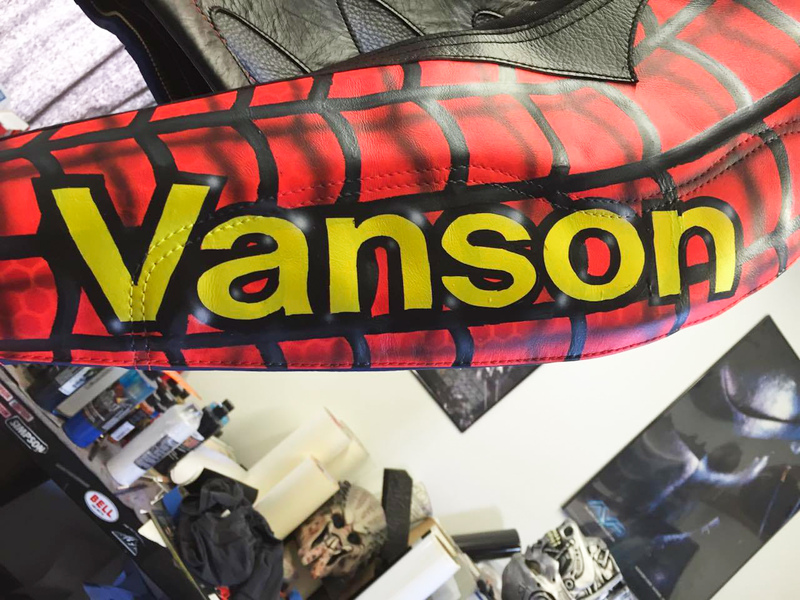 This epic new epidermis for America’s favorite Arachnid has been hand crafted by Vanson Leathers featuring art work by Jeff Disinger, of New York. 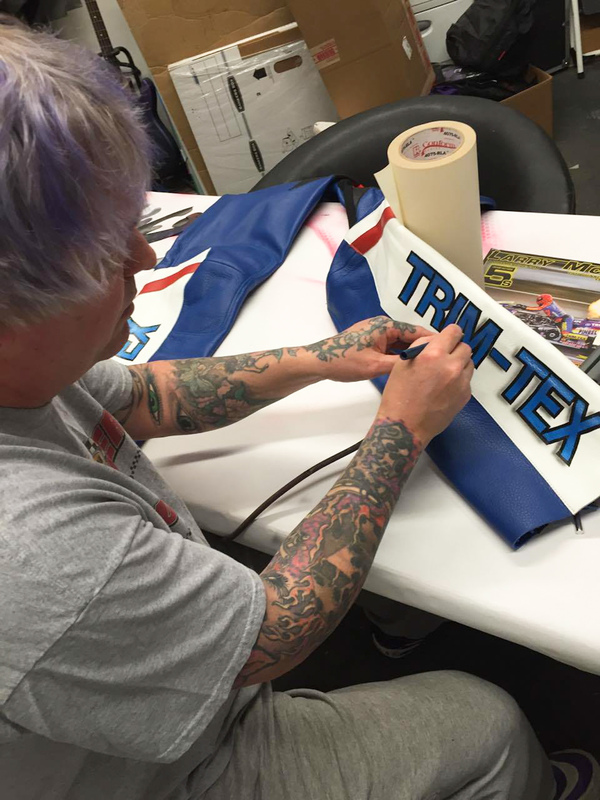 Larry McBride’s new leathers receiving art work by Jeff Disinger, of New York. 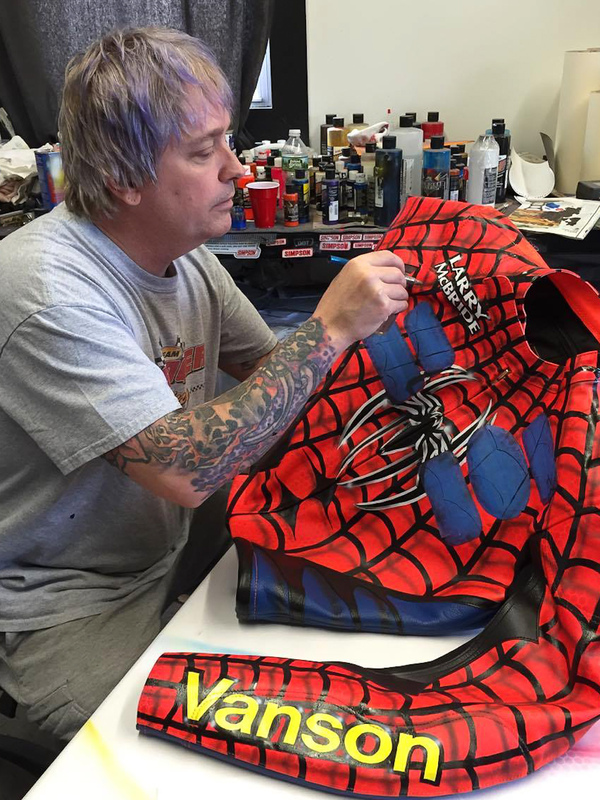 Jeff at his Skin Funk Tattoo shop in Cicero, NY said he was quite busy with a number of projects when he got the call to do another set of leathers for Larry in March of 2016, but “when the Spiderman calls you – you drop everything, put all other projects on hold, and get to work.” The results are mighty impressive to say the least. 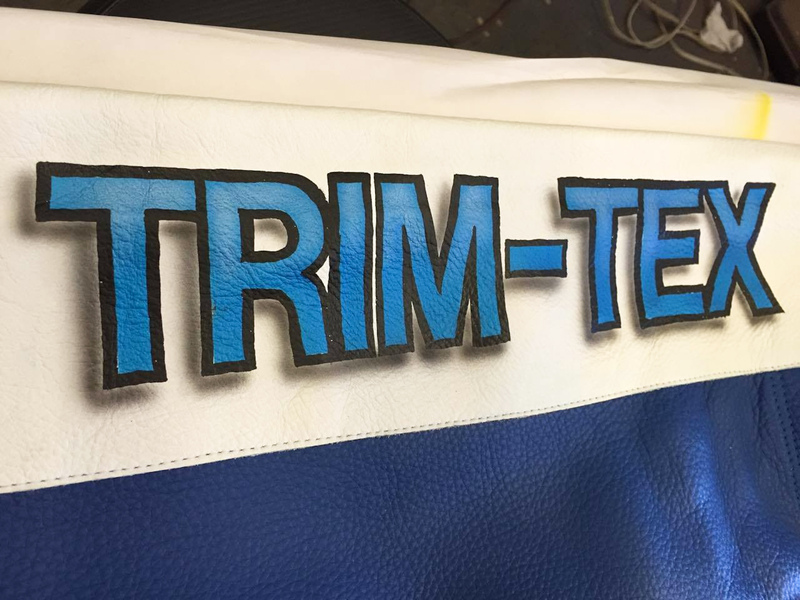 Primary sponsor Trim-Tex on Larry McBride’s new leathers. 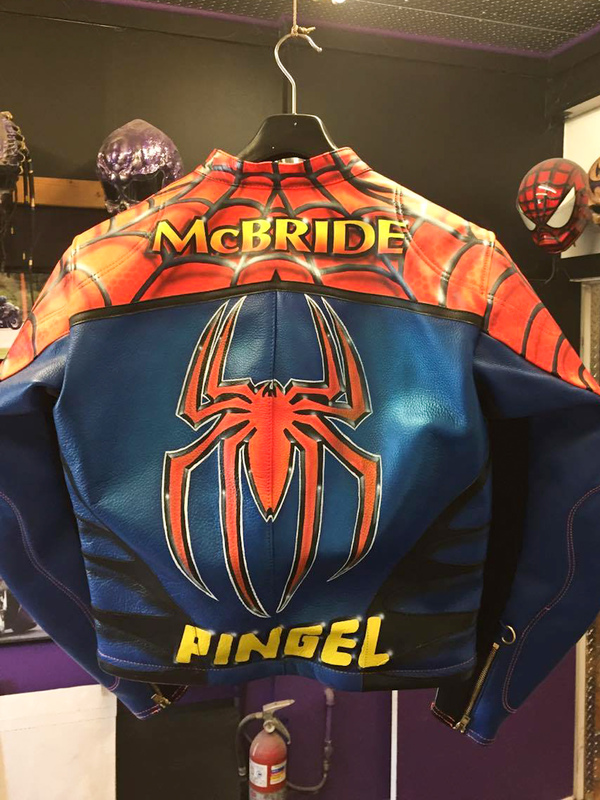 Larry McBride’s new leathers are his most detailed set yet. 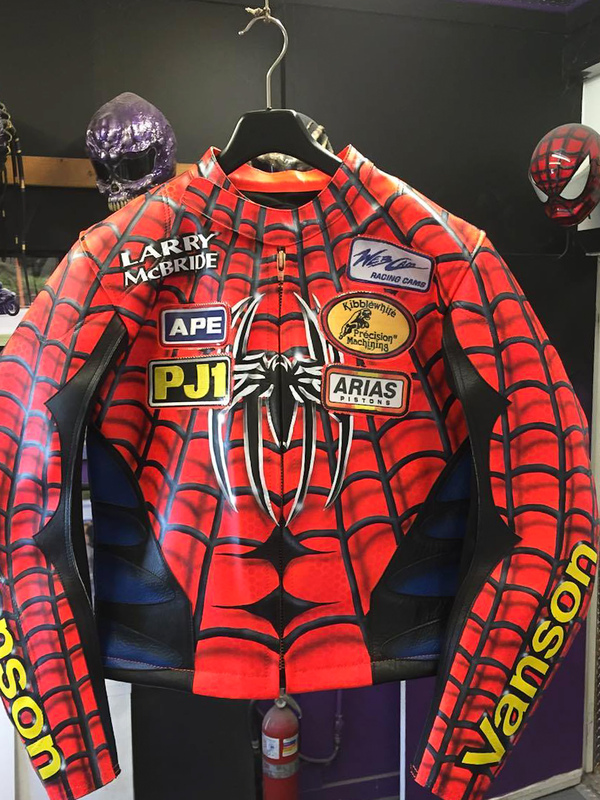 The leather artisans who hand crafted this one-piece racing suit by Vanson Leathers of Fall River, Massachusetts, put not less than ten hours into it creation before it shipped off to the Dice man in up-state New York. Then Jeff dropped everything he was doing and devoted all his time to the Spiderman project. 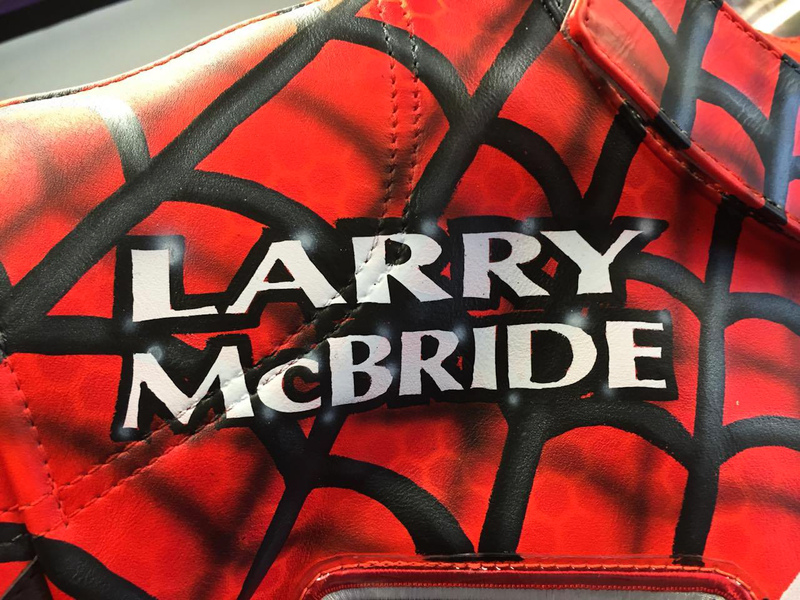 The Trim-Tex lettering pops on Larry McBride’s new leathers. 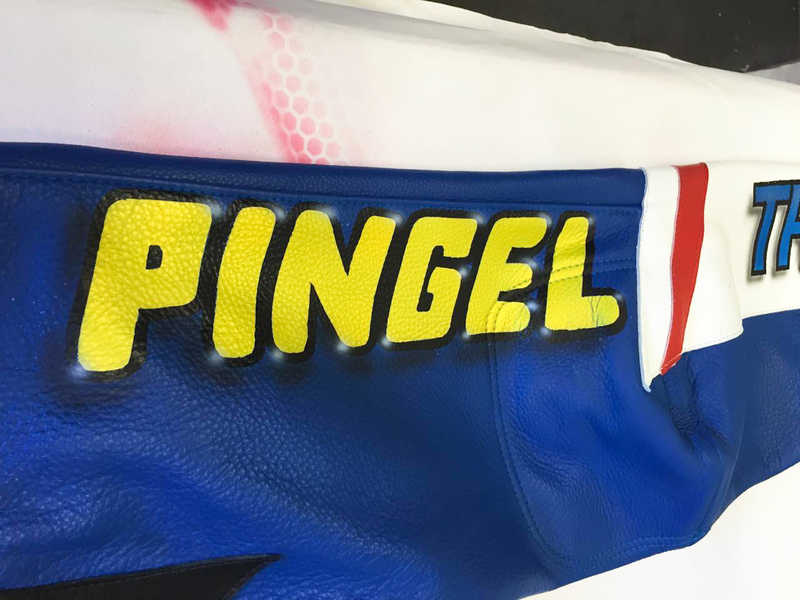 Longtime sponsor Pingel is bright and bold on Larry McBride’s new leathers. 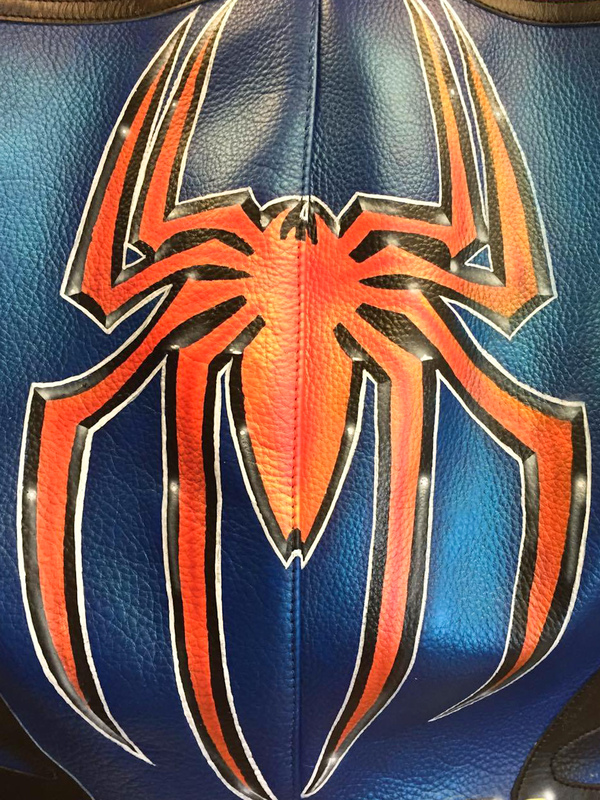 Larry “Spiderman” McBride’s new leathers would not be complete without an intimidating spider. 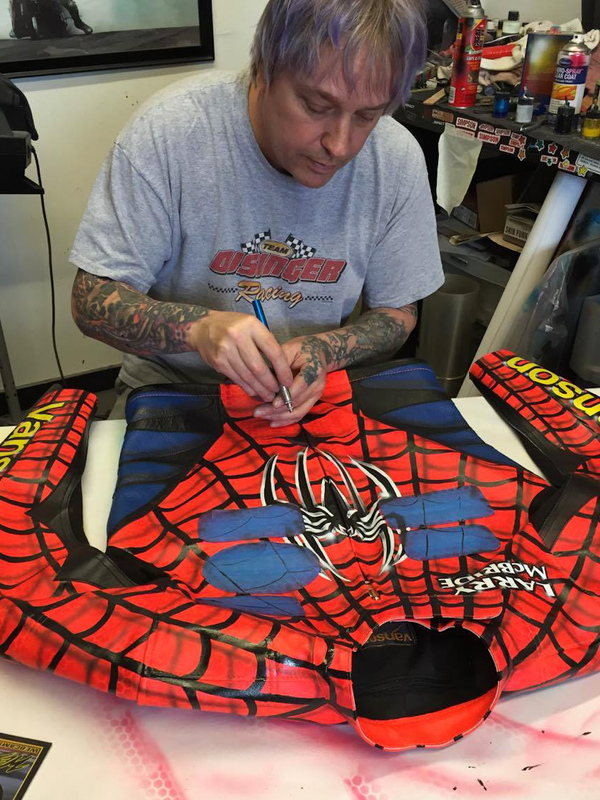 Jeff Disinger put a lot of time into making sure Larry McBride’s new leathers are just right. Jeff Disinger has been to the dragstrip enough times to know what a racer looks for in an eye-catching set of leathers. Jeff is also no stranger to the race track. He’s been on and off drag bikes, cars, and LSR machines since he was a young man. In his twenties, Jeff designed an electric powered drag bike as a concept. The technology for such a project was not there at that time in the mid 1980’s, but fast forward to this day and age and dreams become realities. 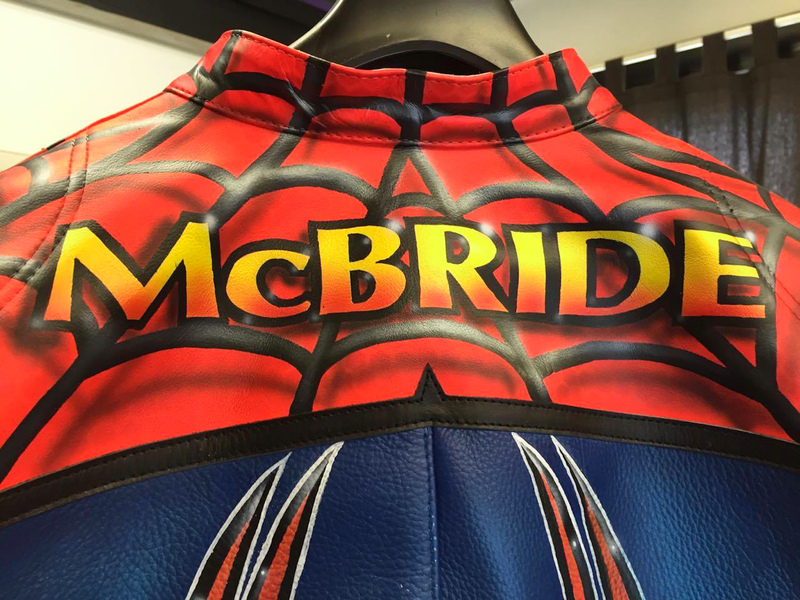 Larry McBride has plenty of sponsors to thank on his new leathers. 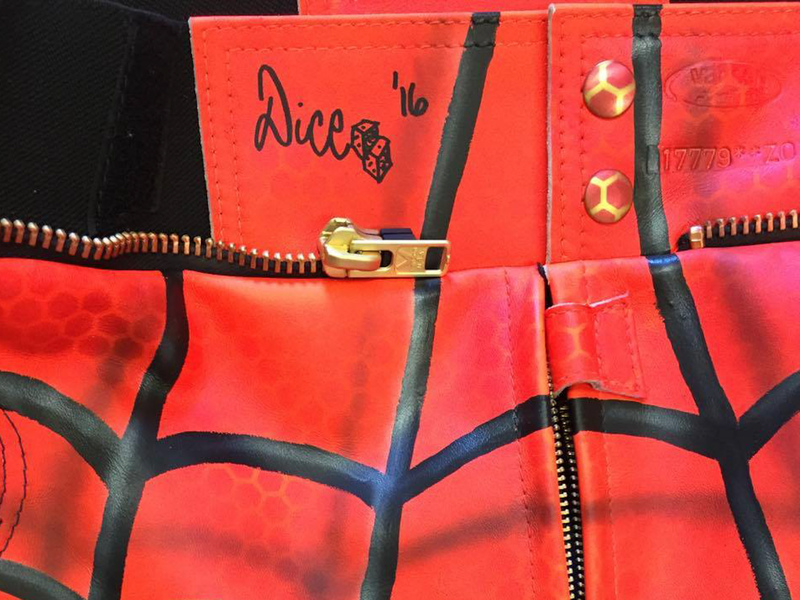 Larry McBride’s new leathers are a work of art. Larry McBride has long been sponsored by Vanson. With changes in electric motors and battery technology, and a TON of effort, Jeff has run a best of 7.84 @ 162 mph sporting a 1.19 sixty foot time! With an electric powered motorcycle, not too shabby by anyone’s standards. Jeff is a multifaceted, multitalented guy, not afraid to take chances. But most of all he’s an artist and a damn good one. McBride thanked his primary sponsors; Trim-Tex Drywall Products, Pingel Enterprise, Drag Specialties-Parts Unlimited, Red Line Synthetic Oil Corporation and Final Swipe Merchant Services. Web-Cam, Vance & Hines Motorsports, Portable Shade, PR Factory Store, Ferrea Valves, Kibblewhite, Precision Machine, World Wide Bearings, Vanson Leathers, Five Star Powersports, Belt Drives Ltd, Simpson Race Products, Nitrous Express, APE, EK Chain, Arias Pistons, Cometic Gaskets, B&J Transmission, Carolina Cycle, L.A. Sleeve, PJ1, Mickey Thompson Tires, Valco, Goodridge, Carlisle Belts, ProJack, Bullseye Visual, Five Star Powersports and Gates Belts.